The Radial Time Projection Chamber, shown installed in Jefferson Lab's Experimental Hall B, was built to measure the nuclei of helium-4 in the experiment. This measurement demonstrates that 3D imaging of the inner structure of the nucleus is now possible. Physicians have long used CT scans to get 3D imagery of the inner workings of the human body. 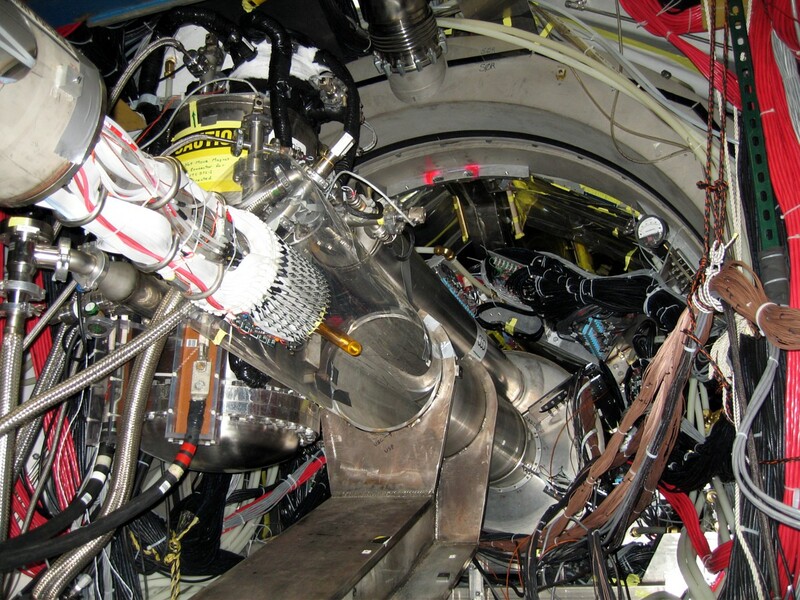 Now, physicists are working toward getting their first CT scans of the inner workings of the nucleus. A measurement of quarks in helium nuclei demonstrates that 3D imaging of the inner structure of the nucleus is now possible. Nathan Baltzell is a postdoctoral researcher at the Department of Energy's Thomas Jefferson National Accelerator Facility in Newport News, Va. He says this successful measurement is one of the first steps toward imaging nuclei in a new way. “It’s a proof-of-principle measurement that opens up a new field – imaging nuclear structure in three dimensions with GPD tomography,” he says. He explains that GPDs, or generalized parton distributions, provide a framework that, when combined with experimental results, allows nuclear physicists to complete a 3D rendering of the building blocks of subatomic particles, such as the proton, neutron, and now, even the nucleus. GPDs are already being applied to 3D imaging studies of protons and neutrons at Jefferson Lab. These studies are helping researchers understand how quarks and gluons build protons and neutrons. Now, Baltzell and his colleagues want to open a new window into the structure of the nucleus by extending this GPD tomography technique to nuclei. The experiment was conducted in 2009 at Jefferson Lab’s Continuous Electron Beam Accelerator Facility, a DOE Office of Science User Facility. In it, electrons were beamed into the nuclei of helium-4 atoms. The experimenters were interested in the roughly 3,200 events they recorded of the electrons interacting with individual quarks inside the nuclei. For each of these events, the outgoing electron, the helium nucleus and a photon given off by the individual quark were all recorded. “To make a precise measurement like this, you want to measure everything that comes out. This is the first time we measured all of the particles in the final state,” Baltzell adds. The result of the experiment was published last fall in Physical Review Letters. Now that the researchers have shown that this technique is feasible, the collaboration is taking the next step to continue these studies with the new capabilities afforded by the upgraded accelerator and experimental equipment at Jefferson Lab. A new experiment has already been planned to begin the long process of actually composing that 3D image of the internal quark-gluon structure of the helium-4 nucleus.